Why do we see gender differences in bowel cancer screening? Bowel cancer screening is the only cancer screening programme which is offered to both men and women. But there are differences in screening take-up figures which show men are more likely to ignore their invitations than women. In fact, just 53 per cent of men complete their bowel cancer screening test compared with 58 per cent for women. It might not seem a big difference at first glance but we at Public Health England want to see an improvement in this figure (and an improvement for women too of course). Significantly, it is also worth noting that men are more at risk of getting bowel cancer than women. This month, raising awareness of bowel cancer is the focus of the Decembeard campaign. This event, which encourages men to grow beards in support, is a hair-raising way to draw attention to the UK’s second biggest cancer killer. So while bowel cancer is on people’s minds, it is a good time to ask: what are the possible reasons why men are less likely than women to participate? It may be that women are more likely to take part because many will already have experience of cervical and breast screening by the time they hit 60, which is when we start screening for bowel cancer, whereas for men, this will be their first invitation into a cancer screening programme. It could be that men are more likely to bury their heads in the sand about their health – particularly with things going on ‘down there’ involving the bowel. It could also be the test itself, (pictured below, click to enlarge) putting people off. Bowel screening – what’s it all about? Bowel screening aims to detect bowel cancer at an early stage, before people are experiencing any symptoms, and when treatment is more likely to be effective. The later a diagnosis is made, the more difficult bowel cancer is to treat. Bowel cancer screening can also detect polyps (small growths on the inner lining of the bowel), which are not cancerous, but may develop into cancer in future. Once identified they can be removed which reduces the risk of bowel cancer developing. The benefits are that regular bowel cancer screening has been shown to reduce the risk of dying from bowel cancer by 16%. The screening test itself is called a Faecal Occult Blood (FOB) test which gets posted out to those invited so they can complete the test in the privacy of their own home. ‘Occult blood’ means hidden blood, which is what the test is looking for. It is blood that can’t necessarily be seen by the human eye. 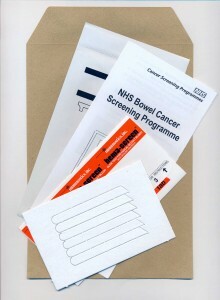 To complete it, a person needs to use a cardboard stick, sent out with the kit, to take a small piece of three different bowel motions and spread them in turn onto the windows on the test kit. Once the test is completed, the card should then be posted in the envelope, which also comes with the kit, to the lab where a chemical is added to the samples on the card to check for blood. Screening is offered to all men and women from the age of 60, and invitations continue every two years until they reach the age of 75. After reaching 75 they can ask for a screening kit, every two years, by calling Freephone 0800 707 60 60. People in the target age group are automatically sent an invitation, then a screening kit, so they can do the test at home. GP computer systems automatically generate contact details for the invitation letter, so it’s important that a person ensures that their surgery has their correct name and address. Why don’t we screen at a younger age? This is something we do get asked – particularly when there are deaths such as that, earlier this year, of charity activist and blogger Stephen Sutton, who died of the disease aged just 19. But the fact is that bowel cancer in young people is very rare, and even rarer in teenagers. There are almost 40,000 cases of bowel cancer diagnosed each year, however, more than 80 per cent are found in people who are aged 60 and over. What is needed for everyone is better understanding of the symptoms of bowel cancer and prompt reporting of symptoms to a GP. What are the signs of bowel cancer? Symptoms to look out for include a persistent change in bowel habit, bleeding from the back passage, abdominal pain (especially if severe) or a lump in the abdomen. We urge anyone who has concerns about their bowel health to speak to their GP, who can arrange for a referral with a specialist, if necessary. Screening is not the answer if a person has symptoms as it can delay a diagnosis. What is really important is that men and women get all the facts so they can make a considered choice whether they go for screening or not. They should know that they don’t have to make the decision on their own. Partners, family and friends can all play a role in nudging those eligible to properly read the letter and leaflet they get through the post. PHE is always looking to improve our cancer screening programmes in line with our priority to help people live longer and healthier lives. That’s why we’re funding a new, one-off complementary screening procedure called bowel scope (also known as flexi-sig) which is for men and women in England aged 55 years old. 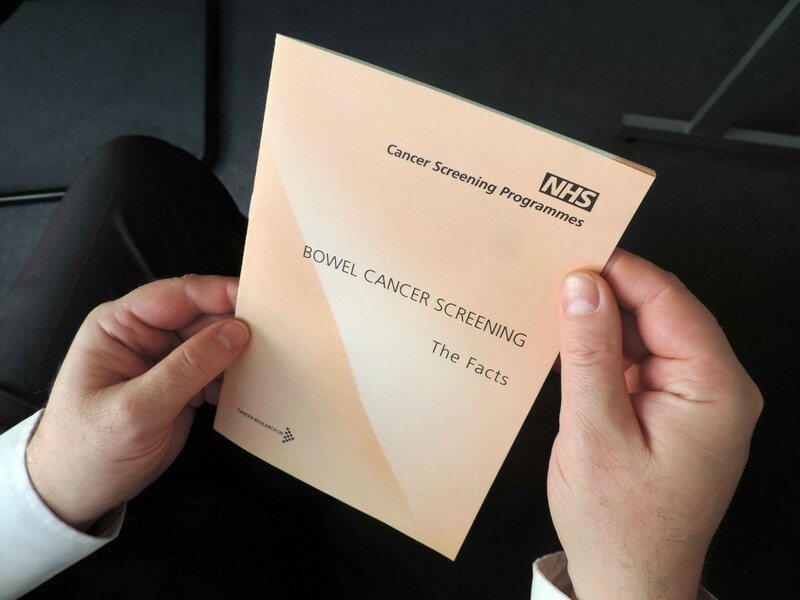 Bowel scope is usually carried out at an NHS bowel cancer screening centre by a specially trained doctor or nurse and usually takes less than 15 minutes. It looks at the lower parts of the bowel where most cancers are found. At the time of writing, an alternative test has just finished being piloted which is called ‘faecal immunochemical testing’ or FIT. Evaluation for this test is now underway. FIT doesn’t just detect whether blood is present or not, it measures the amount of blood present too, which may make it more sensitive. Crucially for the patient, it requires them to take only one sample. We already know that the FIT kit works well in other countries, but it hasn’t yet been used for screening in England. We are currently looking at the data after a six month pilot to assess how the FIT kit would work here, including whether the new kit would be more acceptable to people invited. Although bowel cancer is the second largest cause of cancer deaths in the UK, survival rates are greatly improved if an individual is diagnosed early. Screening is an individual’s choice, so they must be sure they have all the information they need before making that IMPORTANT decision. Thanks for a very detailed and informative blog. I think the awareness and more open dialogue is a really good point. I also think Peer and people sharing their knowledge may help to raise awareness and take forward a dialogue is helpful. Women are more likely to take part because they are hounded at every opportunity to screen for this that and the other, bombarded with letters, phone calls, GP visits for other ailments are interrupted with "you are overdue" and encouraged or persuaded in every way possible, from emotional blackmail to you must, should etc. There is no OVERDUE anything for an elective/optional screening test which can carry high risks of overtreatment with possible associated problems thereafter. Something GP's and nurses need to be reminded of!